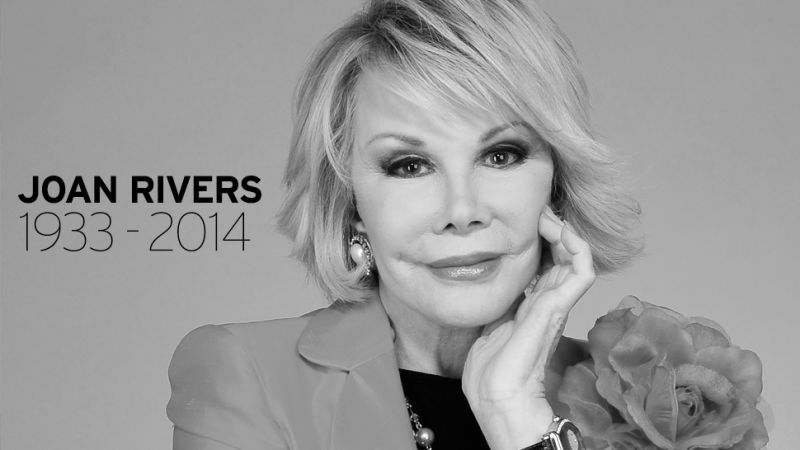 Legendary comedian Joan Rivers died this afternoon, her daughter Melissa announced. She was 81. It is with great sadness that I announce the death of my mother, Joan Rivers. She passed peacefully at 1:17pm surrounded by family and close friends. My son and I would like to thank the doctors, nurses, and staff of Mount Sinai Hospital for the amazing care they provided by mother. My mother's greatest joy in life was to make people laugh. Although that is difficult to do right now, I know her final wish would be that we return to laughing soon. Rivers was briefly placed into a medically-induced coma in late August following complications from vocal chord surgery, when she stopped breathing. After being brought of the coma, she was placed on life support. She was treated at New York's Mount Sinai Hospital and was taken out of intensive care and moved to a private room Sept. 3. Before her death, Rivers was a regular panelist on E! 's Fashion Police and co-starred in a reality series with her daughter Melissa on WE, called Joan & Melissa: Joan Knows Best? A prolific standup comic, she is perhaps most widely known for her acerbic (and occasionally controversial) red carpet interviews and talking heads stints for TV Guide and E!, often accompanied by Melissa. Rivers' breakout role was as a guest on The Tonight Show in 1965.